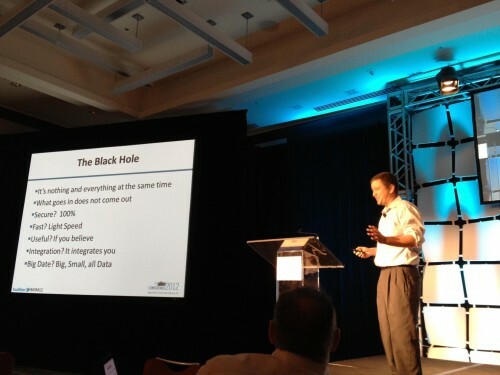 Last week both Dan and I spoke at the AIIM 2012 Conference. Dan told the audience that paper is silly, and I spoke about how the Cloud is dead. You heard me. I said the cloud is dead. I started my presentation poking fun at those who oppose new technology, explained how the Cloud is dead, and continued with how the future is a “Black Hole”. The “Black Hole” is secure; what goes in does not come out. It is fast, lightning speed. Can you integrate it? No, it integrates you. Does it support Big Data? Big data. Small data. All data. The point is that technology is not going to stop changing. You can either embrace it or resist it until you’re left with no choice but to adopt. Yes we like to talk about “Cloud” and “SaaS” and all these new things, but utlimatly all anyone is trying to do is solve problems. And if the problems are solved successfully, technology gets out of the way. So, stop saying you won’t adopt something because it’s “too new” and start focusing on what matters – productivity. If you focus on productivity, the cloud happens. Well designed and implemented cloud solutions allow companies to bypass hassle and find scalable solutions to critical business problems. You can start small, fail fast, and scale fast. The CloudShare experience fosters productivity. Development and testing hardware are no longer of concern. Users can move their sandbox environments to the cloud and as a result, are able to gain full agility. We know you don’t really care about our servers, firewalls, and teams of people who support the infrastructure. We know you want to get on your virtual machine, develop, test, and share. So, our job is to get out of the way and let you do that. When we enhance CloudShare ProPlus, we’re focused on your ability to be productive. View more presentations from Chris Riley.